Most recently TAP, in partnership with Kiwanis Club (Roger Larsen), delivered 93 refurbished computer systems to an underserved school in East Kentucky. Some 11% of the students in the school are homeless and about 75% of the students live below the poverty line and are on the Federal School Lunch Program. These donated systems represent 93 impoverished families now with access to the internet, where the children can compete with their peers and have a chance to break out of the poverty cycle. Tap contributed 20 systems plus some miscellaneous items to the recent Garage Sale. Sales from the TAP donations were approximately $5,000 of the total sales of $14,272 – about 1/3 of the total for the Garage Sale. Beneficiaries of the sale were Habitat for Humanity and Tellico Village Community Church Crafters. Also, Warren reported that 84 systems have been prepared and will be picked up on November 16 by members of the Kentucky Kiwanis Club to be distributed to the Caverna, KY, School District. Warren was advised by the School Superintendent that 15% of the District’s school children are homeless and 90% are on the free lunch program. The following reprint from the July 2018 Newsletter is provided in response to the request at the October TVCUC General Meeting for additional information about TAP assistance to the NSEFU. The letter below was delivered to Warren Sanders in the TAP office. 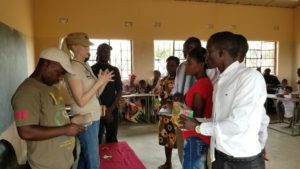 I am Pandora Vreeland’s sister Coe, and you graciously donated laptops and tablets to our foundation for our school project and for our anti-poaching ranger team. I cannot even express the reaction, the sheer joy, and the incredible gratitude that everyone involved felt when we handed out your donations. The teachers at the school practically “levitated” with joy! I wish you could have seen firsthand the absolute happiness that erupted in the classroom. We are truly humbled we were recipients of your dedication and invaluable tools to help people reach their dreams. You could not ask for more humble and grateful people. Thank you for letting me be the conduit of joy on my trip. I have a picture attached with one of the teachers holding a computer like he was holding the Holy Grail! It was magical. Our rangers are thrilled to have the tablets and it will help our getting reports in a more timely fashion. Again, on behalf of Team Nsefu…thank you for believing in our work and giving such deserving and humble people a gift that would otherwise be impossible due to abject poverty. NSEFU Wildlife Conservation Foundation is a non-profit organization specializing in cutting edge anti-poaching programs and strategies in Zambia.